Egypt rejects plan that would see Gaza residents use the Rafah crossing, saying Gaza is still Israel's responsibility. Egyptian officials have angrily rejected an Israeli proposal that would see civilian traffic in and out of Gaza take place at the Egypt-Gaza Rafah crossing alone. Under the plan, proposed by Transportation Minister Yisrael Katz, Israel's Gaza crossings would remain closed. Hossam Zaki, spokesman for Egypt's Foreign Ministry, accused Israel of attempting to “evade responsibility for Gaza and dump it on Egypt.” The plan is “completely unacceptable” and “reveals Israel's bad intentions,” he said. "Egypt confirms that Gaza is an integral part of the occupied Palestinian territories, and of the future Palestinian state. There is no room to talk or think of it as anything else,” he emphasized. 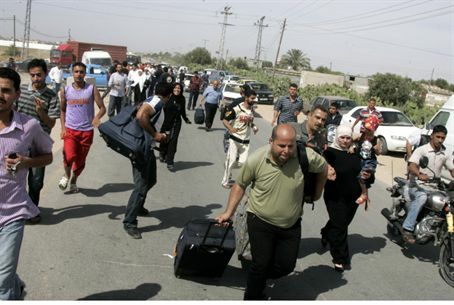 Egyptian officials recently promised to open the Rafah crossing indefinitely. Shortly after the crossing was declared open, activists reported that they were turned back and not allowed to enter Gaza. However, most would-be travellers have apparently been allowed through, and so far more than 5,500 have left Gaza and 3,500 have entered. Previously, Egypt's border with Gaza was closed to both civilian traffic and goods, although occasional exceptions were made for pilgrims to Mecca or for those wounded in IDF counter-terror operations. Israel's border with Gaza has been sealed since the kidnapping of Israeli soldier Gilad Shalit and the Hamas takeover of the area soon afterward. Borders are open only for the passage of most goods and in cases of medical or other humanitarian need. Katz's plan aims to take advantage of the fact that if Egypt's border with Gaza were to open, Israel's closure of its own border would no longer be considered a blockade.